San Francisco has produced countless acts that have defined, and even created, entire genres of music from the psychedelic movement to some band named METALLICA. 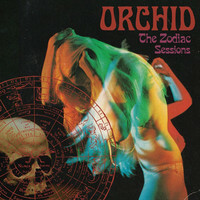 On “The Zodiac Sessions”, Stoner Metal darlings ORCHID, somehow manage to add their name to the list with a seedy, grooving, bong hit ripping trip through the dark side. Poster children of the Stoner-hipster-Metal phenomenon, ORCHID has released a mess of music since forming in 2007. “Zodiac” is a collection of the bands earlier work, the “Through the Devils Doorway” EP and the killer full-length, “Capricorn”. Newly re-mastered, both records sound excitedly crisp and full, begging to be played at full volume with no remorse. If you really stretch your chemically altered imagination, you can see ORCHID onstage at the Fillmore ruining every ones buzz with their hemorging wall of sound and message of absolute Doom. Maybe that trippy vision is a little too heavy for your current state of mind but these guys are making retro sound progressive, conjuring the very best of classic BLACK SABBATH, PENTAGRAM and DUST while burning a path all their own. “Capricorn” is just plain creepy as the boogie virtually drips off Mark Thomas Baker’s guitar. It’s almost impossible to understand how the refrain gets so heavy with one guitar player but Keith Nickel hammers the bass strings so hard it shakes the ice in your glass. Carter Kennedy handles the back end nicely with deeply body shaking drum work, the perfect complement to the classic crushing being done by Baker and Nickel. Theo Mindell leads the charge with a howling voice resembling Bobby Liebling at his evilest. Baker throws the black cloak of doom gently over the listeners head with “Black Funeral”, the perfect late night graveyard hang out song, Mindell sounding like he is trying to raise the old souls of San Francisco’s past for an undead freak out. On “Eastern Women” we hear the marching guitar rhythm that has lead Orchid to the head of the stoner rock pact. It’s raw and unrelenting, showing a hint of what was to come as the band grew into their already legendary “The Mouths of Madness” record. It all comes to a crashing conclusion with “No One Makes a Sound”. Mindell lays it out on the line, letting us know that ‘they ain’t going to listen now, until no one makes a sound’. Eye opening stuff reminding us that heavy licks and heavy lyrics are how this whole San Fran thing got started. While a double re-packaging of not one but two records, neither one a decade old, is a little pretentious, original ORCHID vinyl is already fetching a pretty penny online. Sporting some groovy new art from multi-tasker Theo Mindell, “Zodiac Sessions” gives first time listeners a chance to pick up some old ORCHID on the cheap (for now) and gives those who were there the first time a second hit off the good stuff.